Create a versatile feeding spot in your yard with the Audubon Going Green Peanut Feeder. Adding a peanut feeder to your garden provides treats for a wide variety of birds, as well as squirrels and other animals. The recycled plastic, lime green frame on this item brings not only bold color to your yard; it also adds an environmentally sound hint. A green, coated metal grid forms two sides of this feeder, creating a reservoir which holds up to 0.75 quarts of peanuts in the shell, a few suet balls, or even a suet log. The 1" square openings on this grid allow birds and other animals to reach the peanuts, while an extended base platform provides a resting spot. The pitched roof fully covers the center reservoir, protecting it from the elements, and an attached cable makes it simple to hang the piece. Its bright green tone adds a wonderful hint to the yard, while the recycled plastic construction reduces landfill waste. 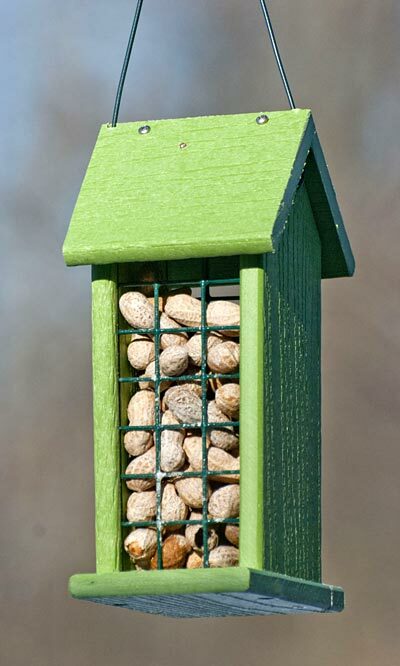 Place a hardy and versatile feeding station in your backyard with this Going Green Peanut Feeder. Made in the USA.